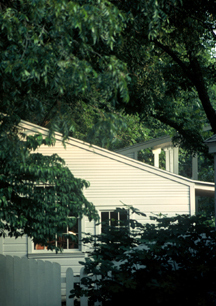 Richard Wright Architects (RWA) was formed in 1984, when Rick Wright set out to realize his vision of architecture and design, conduct business in accordance with his values, and enable his family to be an integral part of the journey. 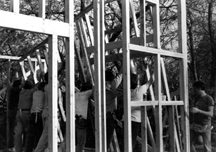 On the Vernal Equinox of 1987, about thirty friends and family members participated in a “barn raising” to construct a free-standing building behind their 1925 home in Old East Dallas which would house Rick’s studio. 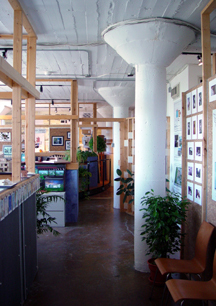 Prompted by an influx of larger and more complex projects, in 1999 RWA moved into a loft space on the top floor of a six-story converted warehouse on the edge of the Deep Ellum area in Dallas, where they remained until 2011. The area was a colorful and eclectic blend of art, music, food, places, and people who appreciated the richness it added to their homes and businesses. 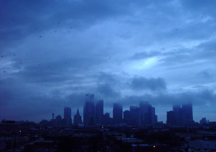 Oh yes, and we had a dynamic view of Downtown Dallas. In 2014, Richard Wright Architects celebrates 30 years of successful, challenging and fun projects, creative problem solving, satisfied clients, and compelling stories. Richard Wright Architects utilizes a diverse network of licensed architects, interns, support staff, interior designers, digital imagers, consultants, tradesmen, and construction experts to tailor our team to meet the needs of our clients. Keeping our staff flexible and appropriate to the task at hand allows us to keep overhead low, and to stay responsive. After 30 years in business, RWA enjoys a diverse project mix including Commercial, Institutional, Retail, Industrial, Religious, Historical, Residential, and Sustainable projects. We count several Fortune 500 companies among our clients, and have architectural licensure in California (#C-30614), New York (#032020), and Texas (#9132). Rick Wright is a LEED-Accredited Professional (AP), and a member of the United States Green Building Council (USGBC) – North Texas Chapter.